Lincoln doesn’t get to play with our phones. We grew up just fine without them. The kid doesn’t need to be glued to a screen for his entire childhood. But there is one exception where he gets to play with a phone…..a haircut. It’s the only thing that will keep him still enough to sit through a haircut from his amateur hairdresser of a mother. We turn on guided access so nothing is deleted and he sits perfectly still. 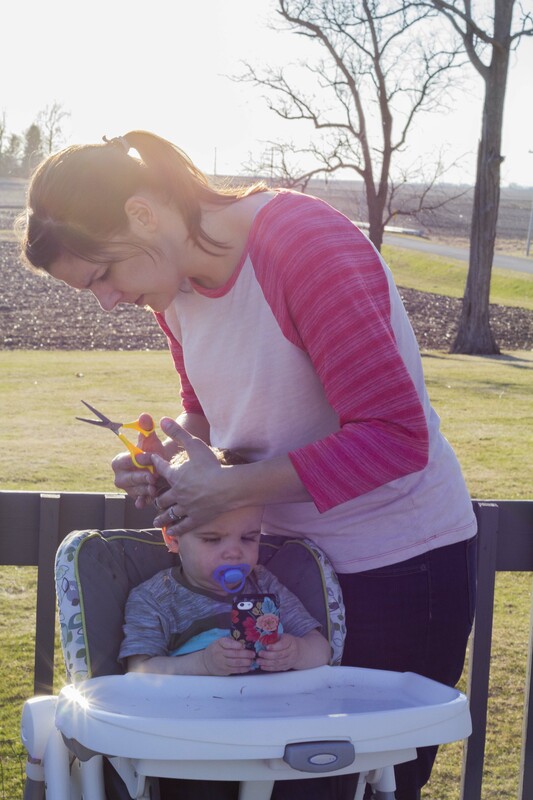 We cut his hair outside under the warm sunshine. Another weird hatching of flies has occurred, so we had to make it quick and I had to keep swatting them away. I also cut the bejesus out of my finger. I couldn’t finish the haircut. He only napped for 40 minutes today, he’s still cutting his teeth, so he was completely bent out of shape by the end of it. He was screaming bloody murder as we started to draw his bath, I took off his diaper so he could streak through the house (a favorite pastime activity and a trait he must have gotten from his father) only to have him pee on me. And then freak out even more when he realized what he had done. Motherhood really is beautiful.